The project involved the development of a new Courtyard Hotel in Aberdeen and is located at the southern edge of Aberdeen Airport. 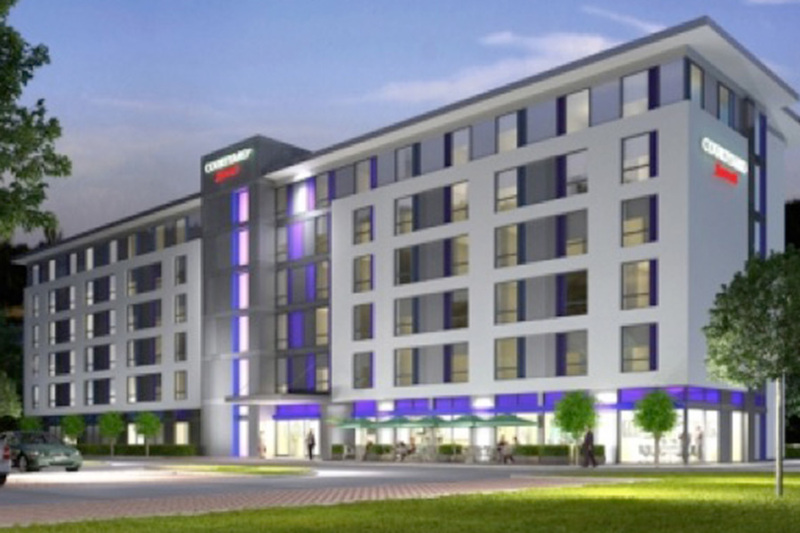 The project is the first of the new Courtyard hotel brand prototype to be developed and constructed within the UK. Developed directly for Marriott, this 194 – bedroom hotel is deliberately prototypical to allow the new brand to be assessed by the market. Public areas are compact and based around a “flexible all day bistro restaurant” and the concept of ‘refreshing business’ with the creation of pockets of space for business travellers to hold informal meetings or simply relax, with technology at hand. Fairhurst’s input was to provide civil and structural consultancy expertise to the design of this building structure and foundations and the associated external roads and car parking. The six storey building is formed using a lightweight steel framing system for the upper five floors supported on a transfer structure at first floor level. The lightweight steel framing system comprises composite metal deck/insitu concrete floors supported on load bearing walls formed using lightweight steel metal studs. The transfer structure is a structural steel frame designed to transfer the loads from the structure above to columns located to suit the open plan architectural layout at ground floor. The structure is supported on reinforced concrete spread foundations bearing on natural sands and gravels.